In this blog post, I am going to show an existing functionality of image upload using a form with the help of PHP and jquery. Often you would have seen the option of image upload while filling your college, office, interview form. Here you upload your image and submit with the form. this functionality is very important once we have to collect the image of our users and any other things depend on the context of the requirement. You can also use this image upload functionality as your school project and show it as a collection of images would also take over to form an image gallery. So How to build this functionality? Friends, this is a very simple to build just follow the below-given procedure step by step and you will be finished with an image upload code or software. We used this above software for this project though you can use any software supporting PHP, HTML, Jquery or that you are familiar with. As per the above file structure, you just make a PHP project name as image upload or you can have any name as per your requirement. Now create all the files as shown in the above file structure. You can rename the pages but make sure to change the same in the code given below. You will also need to create one folder name as upload folder. See the file structure image for the same. You will also need to download one delete icon image and copy it to your project. Now just place this below-given code into the respective files and run your project by running the upload.php file. // Function for Preview Image. // Function for Deleting Preview Image. // Function for Displaying Details of Uploaded Image. Usually, when you fill up any form you get an option ‘submit’ for submitting your form. But Here we are going to explain you to develop an auto submit form. What is this auto submit form and what is the benefit of this form? A form without an option of auto submit is known as auto submit form. Here the timer is set in the form. If the timer time is 20 sec then the form will automatically submit after 20 sec. The form will not be submitted until you fill all the field correctly. If you fail to submit the information under time or filled wrong information then a timer will again start from the beginning. If you fill any field wrong then a popup will appear to refill the field with correct data and then finally form will be submitted. You don’t have any worry for the form timer as a form will not be submitted until you fill it correctly. You can use this functionality where you have a sensitive form necessarily to be filled. submission of the test paper as having very limited time to submit their form. You can see the form sample in the below image. What is the procedure to develop this functionality? This is a very simple procedure to develop the form, you just need to follow the below step by step procedure for the same. Open your NetBeans IDE and create a project say ‘Formautosubmit’ though you can have any name as per your wish. Create few files as shown in the below image under this project. Now copy and paste the below code one by one to the respective files given below. Now you are ready to run and test your project. 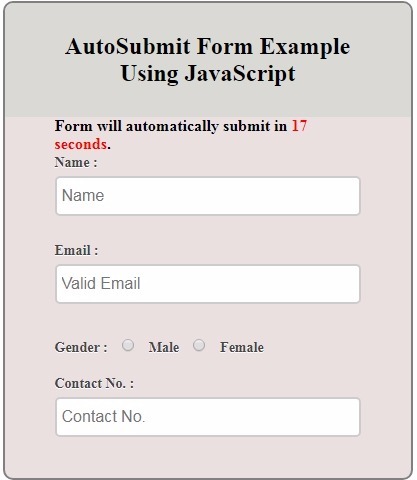 Run the HTML file to fill the auto submit form.